2 0 1 5 S E P T E M B E R P R I N T W E A R || 83 Top: Your blade angle directly affects your prints. Determine which type is best depends on the type of print you're working towards and the ink you're working with. Above: Since white ink is stickier than colored ink, the rate in which it's laid down is crucial. 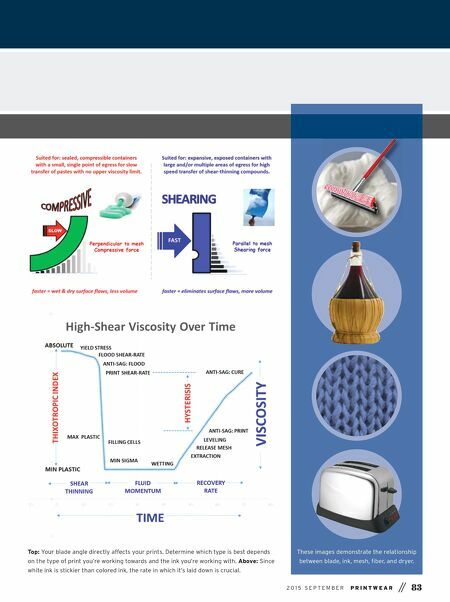 These images demonstrate the relationship between blade, ink, mesh, fiber, and dryer.